Of all the history plays of Shakespeare, the one which has always fascinated me most is “Henry V”. From its prologue, which defines the very essence of live theater and the suspension of disbelief, through the humanity of its central figure wrestling with the understood demands of the crown and the lasting echoes of a misspent youth, it has an articulation of language and emotion which have always caught my imagination. Now a new, pared down version of this great play is opening the spring repertory season at A Noise Within in Pasadena. Gifted with strong and versatile actors and a direction which keeps the play from becoming too static, it seethes with the balance of forces which can make a rational man move into war, and a different, more immature one look upon it as a playful adventure. The great speeches are there, and the essential elements, but the particular editing of the script (though some version is almost always necessary for modern playgoers) leaves a question mark or two. In this production, and with a couple of exceptions, everyone in the comparatively small company plays at least two and sometimes three parts. Everyone joins in to give parts of the various speeches assigned to Chorus, rather than have someone assigned that part. This proves an interesting effect, although cutting up the speech into chunks may dilute the power of what is said. Even so, that it all works as smoothly as it does is a testament to the versatility of the company, and the singular vision of the directors. Indeed, that character’s popularity had obviously begun to weigh upon the playwright, or the actor playing Falstaff, to the point where this play is used to kill him off. Which is where the production at ANW becomes interesting. In the editing of the play done, one assumes, by directors Julia Rodriguez-Elliott and Geoff Elliott, the comic characters who had surrounded Falstaff are given fairly short shrift. They show up briefly and some of their more comic moments are cut. This is perhaps because the focus of this spring repertory is on courage, and too much emphasis on the bawdy or self-serving nature of these comedians would detract from that larger theme. Olivier did much the same – needing to concentrate on Henry the hero – when filming the play during World War II. It works. Still, leaving in an execution scene involving these folk, when you have not explained why that execution would be hard for Henry, makes him seem less conflicted about his role in the life and death decisions his position makes him take. That is unfortunate. Yet, despite this, the play is very well performed. Rafael Goldstein is Henry, making him intense and direct, but as human as Shakespeare intended – able to rouse men to action and to loyalty while still wrestling with the depth of responsibility which comes with what he is doing, Goldstein excels at this kind of balance, and his work centers the play. As his most obvious foil, Kasey Mahaffy is at his best as the petulant Dauphin, while Erika Soto makes lovely work of the French princess, Katherine, who will be one of Henry’s prizes if he wins. All of this is surrounded by a solidly ensemble cast involving many of the best of the ANW company. Still, there are a few question marks which must be addressed. The set, by Frederica Nascimento is imposing, but cumbersome. It is often positioned in a way which appears somewhat illogical, and gets in the way of some of the battle scenes. Costumer Angela Balogh Calin has created amorphous-period clothing which suits the militarism of the piece, and allows for the carrying about of broadswords, but why has the fight choreographer, Kenneth R. Merckx, Jr., only given shields to the French? It makes for much noise, but a seemingly unequal fight. Most uncomfortably, the choice to keep a line without its reason. A sequence has been cut in which the French circumvent Henry’s lines, burn his army’s tents and massacre all the young squires waiting behind the battle. That is fine, as it neatens the whole battle concept, but then why leave in Henry’s statement, written specifically to address hearing of the massacre of these boys, as a closing line to that battle sequence? Without context it becomes wryly comic, and seems out of tune with the character or what is going on. Which is all to say that the performers are very good, and the production proves powerful and interesting. Its visual feel, except when the set gets in the way, has an authority which ties the piece together well. Using a cast of 16 to play 30+ people resonates with what Shakespeare himself was confronted with. And the play works. One could wish some edits were designed differently, and that a Chorus was there as a single voice to call all to use their imaginations, but Henry survives all of this, and does so with style. Go see “Henry V”. It is not often done, and this one captures the central points of Shakespeare’s concept: that a man once profligate has molded himself into an inspiring leader, but at a cost. That this king knows war is hell, but counts on God and the loyalty of his diverse army to push through against remarkably uneven odds to the attainment of what he truly believes to be the right. And all this with some of the Bard’s most inspired language. “Henry V” will soon play in repertory with “A Raisin in the Sun” and, later, the comic “Noises Off”. The best kind of historical plays and films are those which look at some aspect of an era in a complex, yet personal way. This becomes more and more difficult with portions of history which have become iconic, larger than life, epic moments in human or national development. Which is part of what makes “The Whipping Man” by Matthew Lopez, a co-production with South Coast Repertory now opened at the Pasadena Playhouse, so powerful. In the intimate relationship of three men at the end of the Civil War, portraits of slavery, Southern defeat and the lives of the South’s Jewish minority all coalesce. The tale is set shortly after Lee’s surrender at Appomattox. Caleb, Confederate officer and son of a wealthy Richmond business owner returns to his ruined home, a damaged man in many ways. There he finds two of his former slaves: Simon, a resourceful man who acted as butler, and John, a young man his own age who was at one time his friend. Surrounding all three is a unifying element. Caleb’s family is Jewish, and his parents raised their slaves to be Jewish as well, a concept – of a people held in slavery until delivered – which offered a profound message to those so included. 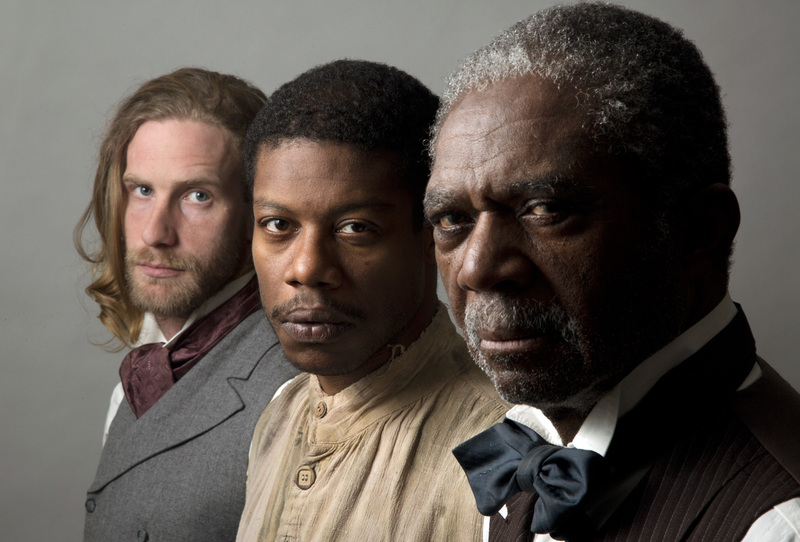 What makes this play work is the unifying themes which underlie all the differences of these three men – the faith, the shared history, and the sheer unknown implied by a post-slavery-based world. This, to which one adds a powerful ensemble cast whose common sense of the play itself and their characters’ involvements make everything connect, and define the play’s power. Adam Haas Hunter makes Caleb profoundly vulnerable, even as the aspects of a life of superiority constantly rumble under the seemingly accepting surface. Charlie Robinson proves a powerful and defining character as Simon, making him a man of innate command, the keeper of traditions. Used to running a household, he exudes a practical and hopeful energy, especially regarding a future he’s sure he can see. Jarrod M. Smith makes the reckless, damaged John a person whose happy-go-lucky opportunism hides deep scars both physical and emotional. Director Martin Benson has a real feel for this play, where visceral connection or dissension is an essential element. His staging keeps the discussions from becoming static – a particularly difficult concept when dealing with a character forced to sit throughout most of the proceedings. Things flow rapidly, and the continuous redressing of the stage in each scene says a great deal before anyone speaks a word. Tom Buderwitz’s half-burned, collapsing mansion sets the perfect tone of change and potential despair. Angela Balogh Calin’s costumes prove essentially historically accurate, and provide changes which also add layers to the narrative in quick, sometimes amusing ways. In short, “The Whipping Man” offers a unique and rounded approach to a very difficult subject. The surprises of the script, which unfolds in an unforeseen direction, only contribute to the sense of seeing something very new about something very old – the best essence of a historical drama, in that it speaks to what has come after in subtle but essential ways. Surprise, enrichment, polish, and a new window from which to view a well-worn subject all contribute to making this play one to see. So go. No matter where you approach this from, it is worth the time. Also, be sure to step into the Playhouse’s Friendship Center. Though I don’t always find “additional information about the play” displays helpful or even appropriate, this time the exhibit, which correlates ancient Jewish tradition, the stories of Jewish participation on both sides of the Civil War, and the connections between Jewish scripture and American slavery may prove extremely instructive to some, as it relates to the play’s essential themes. Now opened as the third leg of their three-play fall repertory, the production of this work at A Noise Within in Pasadena creates an equally stunning portrait of deeply psychological marital dysfunction, laid out in front of a guest who finds himself gradually swept up in the grimly manipulative human interactions there. A new translation by Conor McPherson, receiving its west coast premiere, brings this play out of the somewhat dated tonalities often associated with “classic” works into a contemporary language framework which makes the play both more accessible and more disturbing. Co-Artistic Directors Geoff Elliott and Julia Rodriguez-Elliott direct this one “straight”, allowing the ferocity and isolation of the characters’ worlds to create movement without the unnecessary embellishments which sometime cloud their productions. The result is stark but continually interesting. Like watching a train-wreck, you just can’t look away from these two as they destroy the world around them. Even for the third character onstage, and certainly for us out there in the dark, that the point. Elliott is Edgar, an aging misanthrope whose self-absorption and sloth have kept him a low ranking army officer assigned to a bleak island outpost. He has no friends, no money, possibly no food, but vibrates with a strangely concocted dignity nonetheless. Susan Angelo is Edgar’s wife of nearly 25 years, Alice. A former actress yearning for the life she could have led, she mourns absent children and concocts plots to overthrow her husband. Into this world comes Alice’s cousin Kurt, played by Eric Curtis Johnson. An earnest man of significant rank, he has demons of his own to deal with, but soon falls into the clutches of these relatives who devour his finer sensitivities over the course of the play’s two hours. Angelo and Elliott prove a fine match, with energy levels and intensities so similar the whole piece becomes an unpredictable fencing bout. Likewise Johnson provides an interesting counterbalance to all that ferocity, and proves subtle in his changes from compassion to an increasing loss of veneer. Indeed, this may be the most difficult part in the play – to change while those around you essentially do not. Angela Balogh Calin has created an interesting set – at once solid and see-through. It makes for unique symbolism, but removes some of what would seem to be elemental claustrophobia implied in the script. Her costume designs, on the other hand, quickly and accurately evoke the needed elements of attitude, class and title, like visual shorthand. “The Dance of Death” provides a fascinating character study, and – as with Albee’s later play – considerable meat for discussion. Its view of marriage as a death match, and its dismissal of the collateral damage are disturbingly timeless, making it surprising the play isn’t done more often. Perhaps this new translation will help change that, so that like “Miss Julie,” this Strindberg work becomes a part of the canon. In the meantime, though not for the faint of heart, “The Dance with Death” is well worth seeing. Just don’t expect something Halloween-y. Sadly, its Poe-esque name has already led to some misconceptions in that department. There is a particular challenge to producing a classic comedy for a modern audience. By “classic” I do not mean vintage Neil Simon, but the comedies of Shakespeare, Sheridan, Moliere and others of considerable vintage. The first challenge is to acknowledge that they are, and can continue to be, funny. The second is to find a way to bring that humor to an audience using the play itself, rather than assuming the observers will not “get” or will be bored by the original script. This is the challenge in A Noise Within’s production of Moliere’s spot-on send-up of fraudent piety, “Tartuffe.” A solid translation by Richard Wilbur supplies the base. For the most part, Julia Rodriguez-Eliott’s direction gives the respect, and a proficient company makes the antique language and situation glow with recognizable flair. Almost. The production trips up at the very end, simply because the director either does not trust the intelligence of her audience, or believe in the subtle humor a modern company can create from a historic, tongue-in-cheek, obsequious speech. The shift is so sudden and so glaring it leaves one resentful, rather than glowing with the humor of what is otherwise a splendid production. 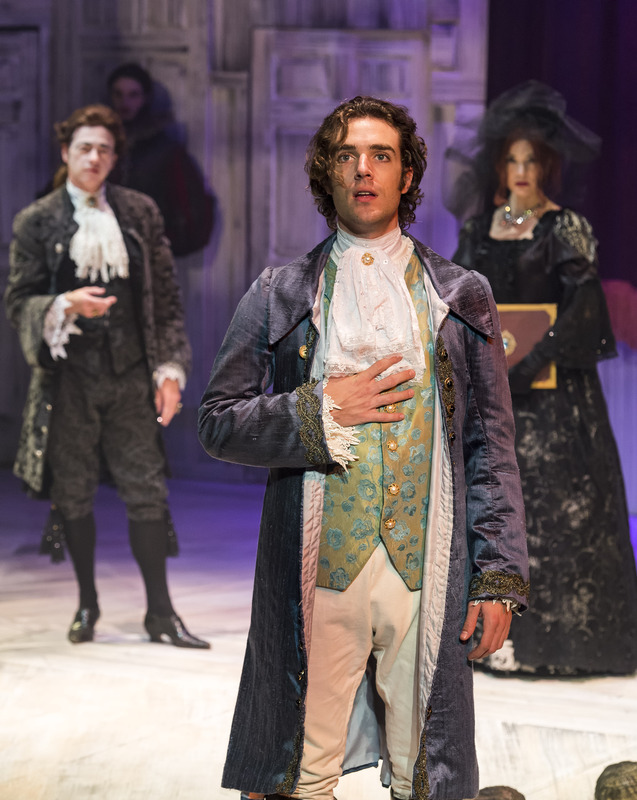 Central to the success of this show is Tartuffe himself. Freddy Douglass makes the flim-flam artist masquerading as an ascetic religious zealot so grating, with such an underscore of sly malace it is easy for the audience to join in the instant dislike most of the onstage characters feel. This balances will against Geoff Elliott’s blindly devoted Orgon. It’s standard Elliott, but here that works well (though one wonders why the not-so-subtle, anachronistic addition of bat-wing glasses is needed to indicate his blindness). The rest of the cast proves equally strong. Among the standouts, Alison Elliott makes fine work of Orgon’s daughter, fighting for her own love life as her father angles her toward the religious con man. Rafael Goldstein makes her original intended just enough of a milquetoast to push the girl to fight her own battle, along with Mark Jacobson as her appalled and frustrated brother. Deborah Strang contributes yet another strong performance as the practical maid who sees the whole thing for the ridiculous situation that it is. Indeed, it all rolls along with Moliere’s wry and somewhat dark humor at the fore, until we reach the end. Understanding that the play was banned twice, this version contains a flowing speech at the end praising the greatness of the King of France (Louis XV) – probably a necessity to finally get the thing on the stage. It’s reminiscent of a similar speech at the end of one Gilbert and Sullivan opera, to counter Queen Victoria’s lack of amusement at a previous satire. Instead of letting the rather overblown (and thus satiric) statements roll as their own comedy, the whole thing suddenly becomes a burlesque skit – out of context and out of character. It’s jarring, and doesn’t let the silliness of the “deus ex machina” ending ride under its own power – a great disappointment. Still, the majority of the production is splendid. 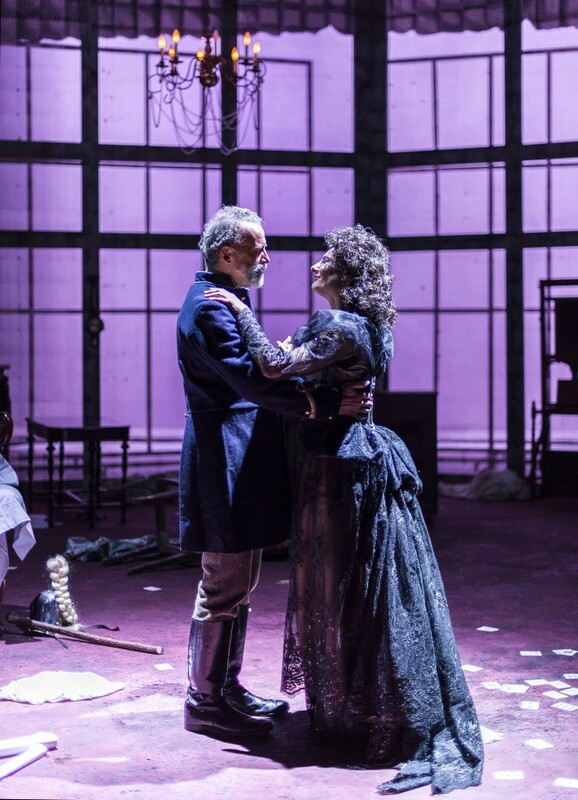 Special nods ot Steven Barr of Trifecta Scenery and to Miriam Dafford and David King, scenic painters responsible – one assumes – for a most intimidating portrait of the title character which appears at a major moment. Angela Balogh Calin’s costume designs cement the sense of period (regardless of the nonsensical glasses). Indeed, it all works, until it suddenly and spectacularly doesn’t. 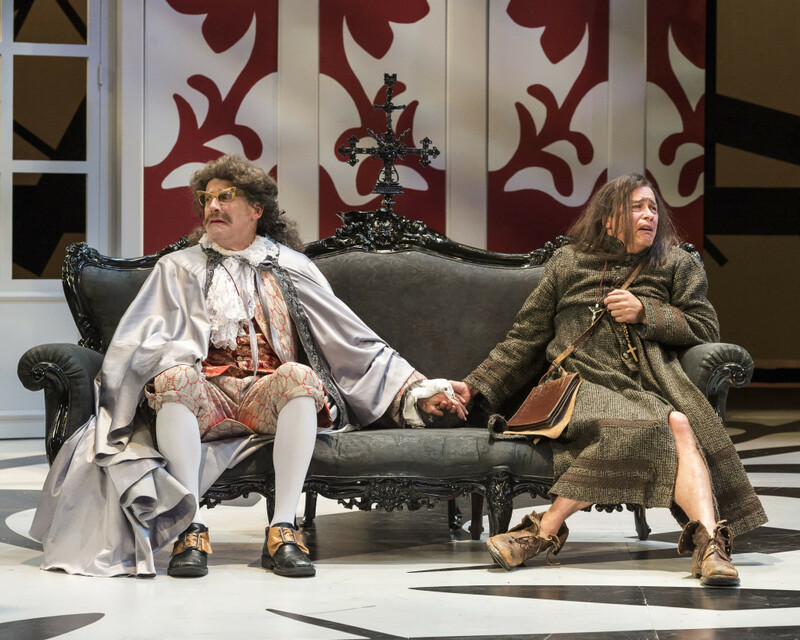 “Tartuffe” has a lot to say about how people can – then and now – be bamboozled into a restrictive and destructive sense of religion. It always surprises me how current Moliere’s central statement is. Most of what you would see at A Noise Within would underscore this. All that needs to be added is for the director to trust the audience enough to understand they will “get” comedy without needing to be distracted from the words, or having them disguised. Of all of the plays published in editions of Shakespeare’s complete works, “Pericles, Prince of Tyre” has the most tenuous connection with him. Most, though not all scholars believe it to be only about half by Shakespeare – a fact which seems backed up by the comparatively clumsy poetry in certain sections of the work. As a story, it proves the Shakespearean equivalent of a soap opera – rife with coincidence, supposed deaths, and tormented souls which, though not unusual in Elizabethan drama in general, is over the top (or at least overly two dimentional) for the Bard. For this reason, “Pericles” is not often produced. If a company chooses to take it on, they must play it absolutely straight – a tough task with a storyline so camp. Which brings us to the production currently one of three plays in repertory at A Noise Within, in Pasadena. Here, this episodic and ridiculous tale proves entertaining in part because of the quality of the acting, in part because of a set and vision which take it out of time and work well on an audience’s “imaginary forces”, and in part because it is played absolutely as if it is the best thing the Bard ever wrote. The tale is of the young king of Tyre, who goes adventuring upon the waves. As a good hero must, he finds a lovely princess he can only win if he solves a riddle. The problem is, when he does it infuriates the asker, who orders him killed. He runs, is shipwrecked, falls for another princess, marries her and then must run again. Another shipwreck, a supposed death in childbirth, a fantastical waterproof burial at sea, a bride on a beach who becomes a temple votress. Our hero parks his newborn baby with a friendly royal in another land. Later, jealousy, a princess in a brothel saving her virginity with noble speech, and after more death threat-driven, salt-laden travels, Pericles reappears and the entire family reunites. Got it? 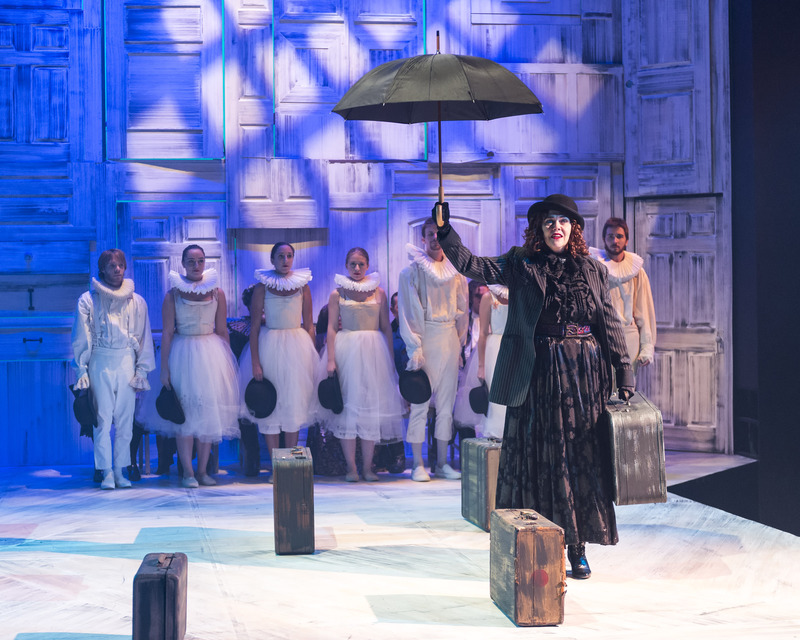 Director Julia Rodriguez-Elliott has a penchant for creating a commedia-esque chorus for her Shakespearean productions, and here it works to keep things light and appropriately otherworldly. Combined with Jeanine A. Ringer’s versatile, compartmentalized wall-as-set and Angela Balogh Calin’s costumes – themselves a fantastical whirlwind of eras and styles – the entire piece is allowed a constant, upbeat pacing, and firmly planted in the world of fantasy. Jason Dechert is, for most of the tale, the consistently honorable, consistently thwarted young Pericles. His earnestness and emotional engagement keep the play moving. As the three central princesses who affect his life, Jules Willcox manages to shift character enough keep the three as specific entities with separate reactions to our hero prince. Guiding us through their various adventures as narrator is the clown-like Gower, given authority and an interesting spin by Deborah Strang. Jane Macfie gives the combined role of Dionyza (no ruler of her land, instead of the wife of one) a balance of warmth and conniving necessary to put Pericles’ daughter in peril. Michael Stone Forrest has a ball as the warm king of the warm land from which Pericles receives a bride. As the warped old king whose anger threatens our prince, and as the aged Pericles finally home from his wanderings, Thomas Tofel creates two very distinct people – one conniving, and one at the end of his rope. Supporting them, in a variety of essential but changing roles is a solid ensemble, some becoming singular characters, others acting as crowd and back-up chorus to Gower. Through them this flow which makes the play work moves on fairly seamlessly. And that is the greatest challenge of this work, other than taking it seriously: keeping the audience engaged while the story hops gleefully all over the Mediterranean. In the end, “Pericles, Prince of Tyre” is still a problematic bit of Shakespeare. However, it’s fun to see it done with such verve and intention. Certainly, it is a challenge to its performers, particularly those who embody many different guises during the course of the story. For a play rarely done, and even more rarely done well, this is a Shakespeare nut’s treat and an education for everyone else.